I’m so ready for it not to be summer. Won’t happen until October though. Ugh, I hate Florida sometimes. The heat keeps me inside. Haven’t been geocaching in over a month. I’m not going to get to my goal of 100 caches by the end of the year at this rate. I have a pool which would be great to get into, but I don’t like to be that exposed to the daytime sun. Its no wonder I’m depressed. I think its like seasonal affective disorder, only I get it in the summer. Sunday Jon and I went to the Florida Aquarium in Tampa. I bought a Groupon that got us both in for basically the price of one. Its a good thing too because it was just kind of mediocre. I was expecting vast tanks with lots of beautiful fish but it wasn’t really like that at all. A lot of the space was dedicated to Florida wetlands, which is nice. There were ducks and other water birds that were nice to see, but most freshwater fish are kind of boring to look at. They did have a few penguins though. That made me happy. 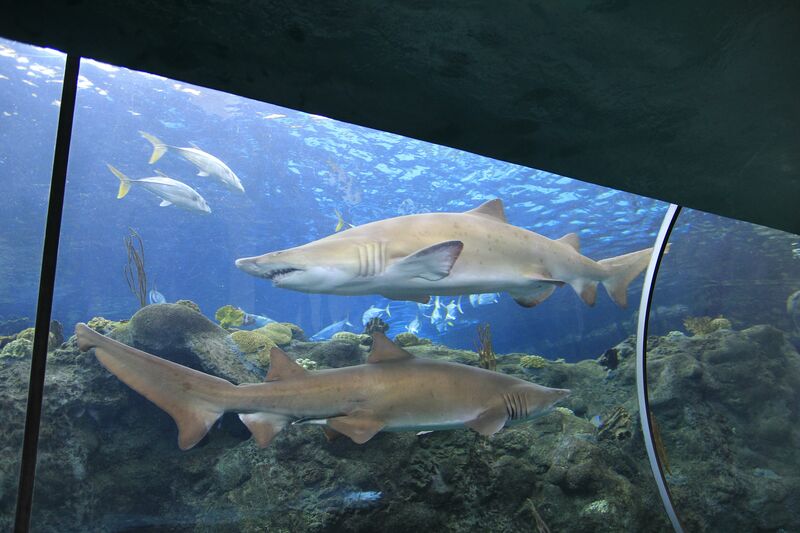 In honor of shark week I’m sharing this picture of a couple of lovelies that were in one of the bigger tanks, the kind I wish there were more of. There was also one tank with a mermaid, but we got there just as she was leaving. I would have liked to have seen that. What a fun job that must be. They had a dolphin cruise available too, but at $16 Jon didn’t want to do it. Afterwards we went to Tampa Bay Brewing Company in Ybor City. Their beer is good but their food is just not that great. We had a perogies appetizer and it was so bland. We ended up getting pizza at some place that had no air conditioning. On a 90+ degree day, it was not pleasant. I continue to not get up and exercise, and I eat very little throughout the course of the day because I just don’t have an appetite. I’m afraid to get on a scale. I was getting nicely toned when I was working out but I can see that fading away, which is discouraging. I just am not that motivated with the program I’m doing. I’ve only got two weeks to complete the six weeks, but the same boring workout every day is just not working for me. I’ve got a new program that’s a pretty intense cardio program, I just haven’t had the nerve to try it yet. Jon hasn’t stayed the night the last couple of nights. For a while there he was here pretty much every night. I’ve needed the space and he has apparently too. My mood is making things hard for me, and for him I’m sure. Its a shame too because he is finally on a school break when things should be more relaxed and we could spend more quality time together. Soon enough the fall semester will start and he’ll be stressed by school again. If I could just get out of this funk I think things would be better. I’ve been doing this 30-day goal setting/personal organization program and I’m following along every day, I’m just not following through. I don’t take any time for hobbies anymore, I’m completely off the schedule I had myself on. I just feel worthless, to be honest, and that’s not a good feeling. I just need to find myself.